As I grumpily note most times I have occasion to review his music I am no great admirer of Piazzolla. Still, I put away my World Music milch cow objections from time to time, and the Claremont Duo certainly make something evocative and sensual out of Oblivion, a piece I�ve heard elsewhere living down to its name. 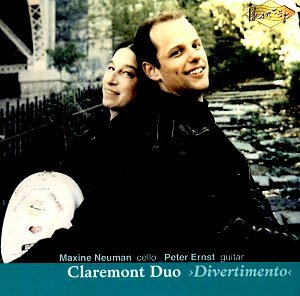 The Duo is composed of cello and guitar so we have a pleasant album of arrangements and transcriptions, in the main, and agreeably charming. Kraft was Haydn�s principal cello in the Esterhazy orchestra and Haydn wrote his cello concertos for Kraft. As a composer Kraft�s geniality is spiced with lyrical ease � that and a songful generosity (one of the phrases in the opening of the Lento cantabile sounds just like a phrase from one of those Haydn Concertos). Neuman doesn�t project an unnecessarily big sound here but is judicious in her vibrato and lyric phrasing � as both are in the finale, with its delicious pizzicato episode, where Ernst�s role is obviously more constrained. The trio of pieces by Fauré are difficult to transcribe really effectively. The guitar accompaniment sometimes clashes with the cello�s string sonority and can also be unsubtle (not in execution � Ernst is fine). Whilst I liked the Sicilienne I didn�t fall for Après un rêve which needs less of the plinky clinky chordal stuff from the guitar and greater phrasal sensitivity from the cello � it�s also too loud and needs more awareness of dynamics. The Mozart Divertimento was apparently originally written for two clarinets and bassoon. They play the Menuetto particularly well with fine and delightful rhythm and a sure control of sonority and nuance. Allen Cohen�s Duo-Partita was written especially for these performers. It contains within it hints of the baroque and is written in a direct and accessible style, most attractively so in fact. There are elements of Spanishry in the accompanying guitar figures as well as more rugged though still affirmatory writing. The second movement is a Passacaglia and Fugue, conventional enough until it begins to swing along the way and the Romanza, though not unclouded, manages to insinuate itself into the mind. The cello plays in alt and the guitar sings single lines � atmospheric and effective and Cohen manages to differentiate the string registers and sonorities well. The sharply etched finale is also etched with moments of nostalgia but there�s also a driving moto perpetuo element that pulses the music onwards that uses the guitar�s percussive potential well, in which each instrument�s quiet reveries are mocked by the other. The final furlong is exciting and wilful. Well produced the booklet notes are tidy and to the point with nothing effusive about it. If the purpose of it was to divert by showing contemporary works, such as the Cohen and Gismonti�s swaying Agua e vinho, in their Divertimento context then I think it succeeds.